WenYu will be home tonight! Not in time for dinner, but I’m so excited that my favorite middle daughter will be back with us for the next three months. She’s had a terrific first year at college, but is ready to be home and get to work. We’re all hoping it doesn’t take her too long to find a job. I’m going to be planning meals like she will be home for dinner every day, but that could change if the job she finds requires her to work evenings. Also, with four of us there might not be as many leftovers for YaYu’s school lunches, something else I need to consider. We will be going food shopping again tomorrow versus next week as we have been running out of things faster than we thought this month. I have no idea why other than last month we had reserves and this month we haven’t. For example, in March we bought two jars of peanut butter, but already had one in reserve and got through until the next shop without running out. This month we bought just two jars of peanut butter and have run out. It’s been the same for several other items, and the refrigerator and cupboards are looking quite bare. The slow cooker balsamic pork roast I made last week was very, very delicious and will be repeated, but huli huli chicken unfortunately didn’t get made. I went to fix the marinade and discovered we only had about two tablespoons left of soy sauce in the jug, and the recipe called for a cup. So, we just grilled the chicken instead, and will try the huli huli later. This week we’ll be using up one of the two roast chickens we plan to pick up tomorrow. About the slow cooker chicken pho: I always cut the amount of spices called for in half, otherwise it tastes like you’re eating a Christmas potpourri. Also, I’ve found it works best if you soak the rice noodles separately, then place them into the bottom of the soup bowls and pour the soup over the noodles. If you add them to the slow cooker the noodles tend to disintegrate. You don’t need to have all the garnishes either – choose the ones you prefer if you don’t have them all (we like cilantro and basil). We’ll have to pick up more cucumbers at the farmers’ market, as well as tomatoes, bok choy, green onions, cilantro, basil and papayas. We can get organic cabbage and lettuce now at Cost U Less, so will stop for that when we do our food shopping. I bought some very good rotini rice pasta here at our local natural grocery and I’ll be sticking with them from now on. Gluten free and the texture is perfect! So glad to hear WenYu will be home today – I’m sure she’ll have a job lined up in a few days. Have a wonderful reunion! The pasta sounds great – still a starch for me though :-(. WenYu made it home safe and sound, and right on time. She said the journey was epic (meaning long), but understands that’s one of the downsides of going to school so far away. i LOVE onion rings, but none for me sadly – they’ve got breading on the outside. I will vicariously enjoy them along with my family. Thank you so much for the pork recipe – it looks delicious! My family loves pork, so I’m always looking for new recipes. 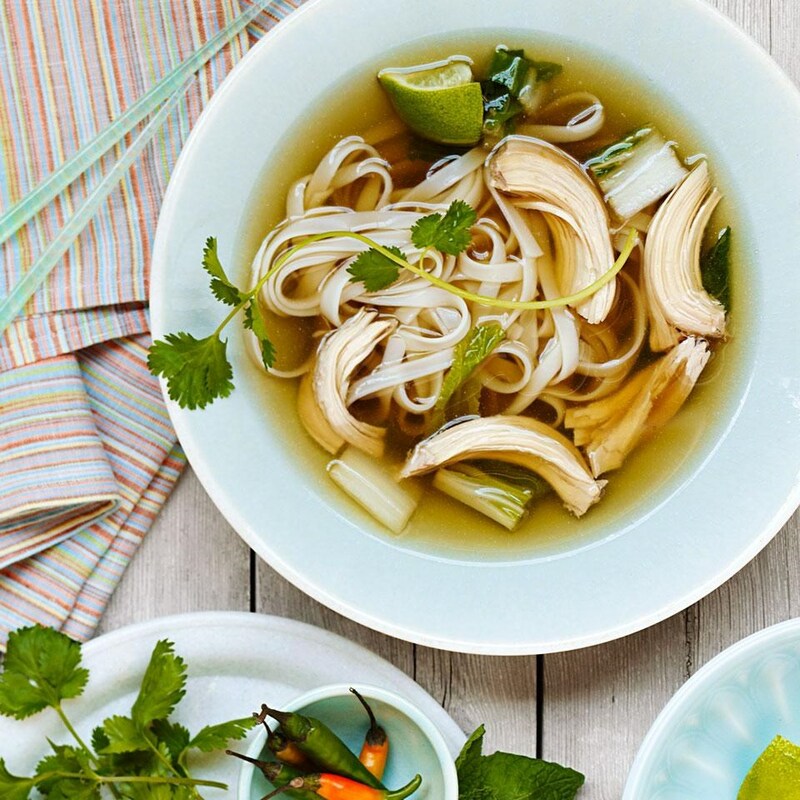 The slow cooker chicken pho looks delicious! I’m adding it to next week’s menu. I don’t have any star anise. Wonder if the co-op would have them in the bulk bin section? I’ll have to check. I actually had pho for the first time a few weeks ago. Excited to try it at home! The soup is very, very good though. I’m not kidding though about cutting the spices called for in half – the first time we made it we were almost overwhelmed by the spices. You can use the chicken like the recipe calls for, but if you have roast or leftover chicken you can throw that in instead. I get my star anise from Penzey’s, but I’ve seen them sold in the bulk spice sections at WinCo and health food stores.